BuddyPress 2.5.0 “Medici” is now available for download from the WordPress.org plugin repository, or right from your WordPress Dashboard. The new features in “Medici” make it easier and more fun than ever to build and manage community sites. Goodbye “plain old text” emails! 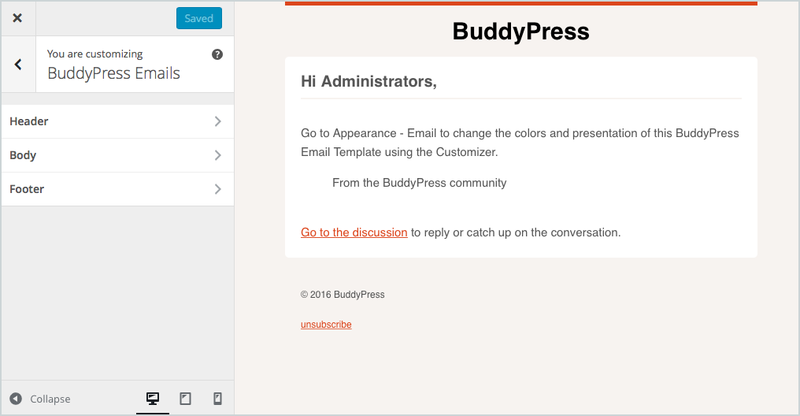 Keep your users coming back with beautiful, HTML-riffic BuddyPress emails. You can now modify the content of your notification emails right from the Dashboard, and adjust the appearance of the included template using the WordPress Customizer. Learn more about this amazing feature at the BuddyPress emails codex page. Since BuddyPress 2.2, new items from custom post types have been reflected in the Activity stream. 2.5 “Medici” improves this feature by tracking post-type comments, too. When the “Site Tracking” component is enabled, replies to a Post Type-related activity item are now synchronized with Comments on the corresponding post post. Read more about enabling this feature for your site on the codex. Holy Moly, Support for Emoji! Have fun, be merry, and share some ❤️! When words fail, you can now use emoji in activity updates, messages, and group descriptions. BuddyPress never looked better in the Twenty Twelve theme. Fun fact: The BuddyPress team loves Twenty Twelve above all others – well, except for maybe Kubrick. Site administrators can now configure which profile fields should create member directory search links, thanks to the new “Autolink” metabox on the Edit Profile Field administration screen. Shared interests like favorite pizza topping? Enable search links! Unique responses like the user’s address or a text box? Now, it’s simple to turn off search links for those fields. Read about all the bug fixes and feature enhancements introduced in BuddyPress 2.5.0 at our official 2.5.0 changelog. Boone B Gorges (boonebgorges), Brajesh Singh (sbrajesh), Brandon Allen (thebrandonallen), Christian Wach (needle), Damian (timersys), danbrellis, David Cavins (dcavins), Dennis (wpdennis), Fee (wdfee), Garrett Hyder (garrett-eclipse), George Mamadashvili (Mamaduka), Henry Wright (henry.wright), Hugo (hnla), Jeff Sayre (jeffsayre), John James Jacoby (johnjamesjacoby), Jonnyauk, Joost Abrahams (joost-abrahams), kennibc, OC2PS (sooskriszta), Laurens Offereins (Offereins), LenLay, Mathieu Viet (imath), mercime, Michael Beckwith (tw2113), modemlooper, Paul Gibbs (DJPaul), Rami Yushuvaev (ramiy), r-a-y, shanebp, Slava UA (slaffik), Srdjan (jozik), Stephen Edgar (netweb), timeuser, vnd. BuddyPress 2.5.0 “Medici” is named not after the famed House of Medici – while BP may inspire religious fervor, we probably won’t produce any popes – but after Medici on 57th, a restaurant in the Hyde Park neighborhood of Chicago. At Medici, you can get great pizza (Chicago-style and otherwise!) alongside great burgers and baked goods. Medici’s graffiti-covered booths and college-town vibe mirror the friendly community spirit we hope your members will feel when using BuddyPress. If you find yourself on the South Side of Chicago, be sure to stop in for a deep-dish Garbage Pizza, the favorite of a certain member of the BP team. Grab BuddyPress 2.5.0 “Medici” from the wordpress.org plugin repository, or right from your WordPress Dashboard. Questions, comments, feature requests, or bug reports? Please use our support forums or our development tracker.